Preheat oven to 350?F. Line two baking sheets with parchment paper or silicone mat. In a small mixing bowl, whisk together the flour, baking soda and salt. In the bowl of a stand mixer fitted with the paddle attachment, cream the butter on medium-high speed until smooth. Mix in the sugars and 6 Tablespoons of dulce de leche. Beat until light and fluffy, about 3 minutes. Beat in the egg, scraping down the sides of the bowl as necessary. The mixture may tend to curdle, which is normal. Adjust the speed to low and mix in the dry ingredients just until combined. Using a small cookie scoop, spoon a heaping teaspoon of dough onto the prepared baking sheets, leaving 2 inches between each cookie. (The dough will spread during baking.) Bake for 10-12 minutes, rotating the pans from top to bottom and front to back halfway through baking time. The cookies should be a golden honey brown with a light crust, but they will still be soft. Remove the pans from the oven and let the cookies rest on the baking sheets until cool enough to safely remove with a spatula. Carefully transfer the cookies to a wire rack to cool completely. Repeat with remaining dough. Once the cookies are completely cool, pair them up by similar shape and size. 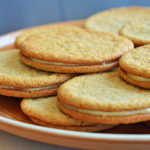 Spread the flat side of one cookies from each pair with a thin layer of dulce de leche, then top with the other cookie. Repeat with the remaining cookies.